The INTBAU World Congress is a biennial forum which brings together global perspectives and knowledge for discussion and debate of pressing issues and #difficultquestions facing the built environment in communities around the world. Explore this year's sessions: contexts, materials, and identities. Can old solutions solve new problems? Do traditions unite or divide? Is global better than local? Do traditions confront or conform? Is local better than global? Over three sessions, the Congress will explore what appears to be a resurgence in the use of natural materials and traditional forms for buildings and places. Based on perspectives and case studies from around the world, speakers, panels, and audience discussions will consider what could lie behind this resurgence. To what extent and where is it taking place? Is it the expression of a quest for identity and meaning, or of nostalgia for the past in the face of an uncertain future? Is it an inevitable, and perhaps temporary, shift into a new period of architectural style? Or does it come from an environmental awareness that resources are finite? Bamboo, unfired clay, and lime – the Zero Carbon Cultural Centre near Makli World Heritage Site, Pakistan. Vernacular architecture shapes local materials into structures that are adapted to local climate and context. Necessity used to play a critical role in the selection of material and form. Over the past few centuries, technological advances have helped make necessity unnecessary. As globalisation, rapid urbanisation, and climate change affect populations everywhere, are we re-entering an age of necessity? 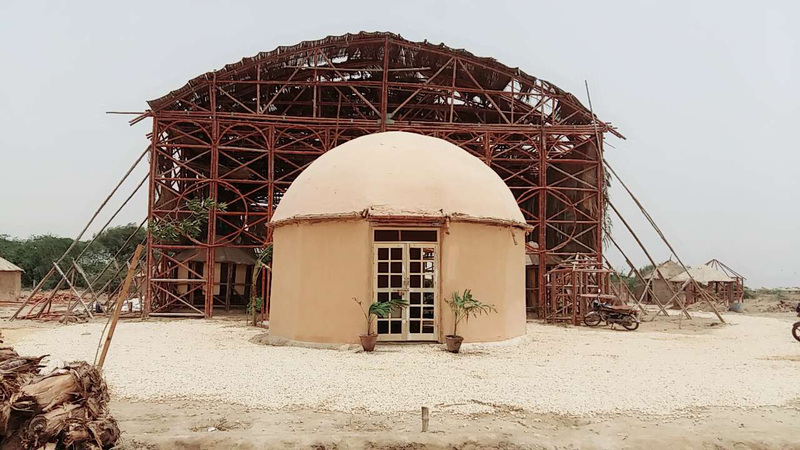 Whatever lies behind it, a resurgence in the use of natural materials and traditional forms could be taking place precisely when there is an increasingly desperate global need for resilient architecture. The 2018 INTBAU Excellence Awards will be presented alongside the World Congress. Submissions have closed, but the winners will be announced soon! Find out more here.